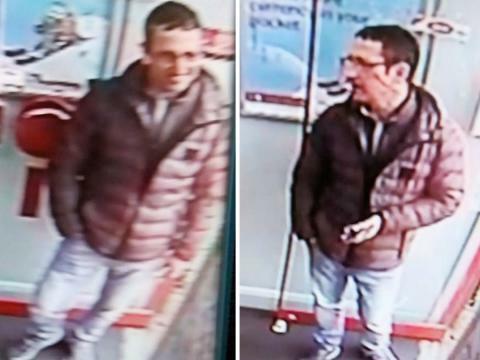 Do you recognise this man sought in connection with the robbery of an elderly woman? Police have released CCTV of a man they would like to speak to in connection with the robbery of an elderly woman. The victim, a woman in her 90s, was pushed over by two men in an alleyway between Kilnmead and The Boulevard, Crawley around 11.45am on Tuesday, December 11 and her purse was stolen. One of the suspects is described as white, 5’ 9”, in his late 20s or early 30s, with dark wavy hair and was wearing a dark coloured long smart jacket with the collar up. The second suspect was white, with brown hair and wearing a blue puffa jacket. Detective Constable Simon Goulding said: “The victim suffered cuts and bruising to her hands as a result of the fall and has been left, understandably, upset by what occurred. “The picture we have released is of a man we would like to speak to as we believe he used one of the cards stolen from the victim’s purse in West Street, Horsham. “Do you recognise him or did you see someone of a similar description in either Crawley or Horsham on the day in question?" You can report information online or by calling 101 quoting reference 1176 of 12/12. Alternatively, you can visit the Crimestoppers website or contact the independent charity anonymously on 0800 555 111.